American Culture: What is Black Friday ? When I first moved to New York City from Japan, I never heard about “Black Friday”. I remember the Macy’s Parade in the streets of NYC for Thanksgiving but did not notice this event the first year. Black Friday is the name given to the day following Thanksgiving Day in the United States, traditionally the beginning of the Christmas shopping season. On this day, most major retailers open extremely early, often at 4 am, or earlier, and offer promotional sales to kick off the holiday shopping season, similar to Boxing Day sales in many Commonwealth Nations. Black Friday is not an official holiday, but many non-retail employers also observe this day as a holiday along with Thanksgiving, giving their employees the day off, thereby increasing the number of potential shoppers. 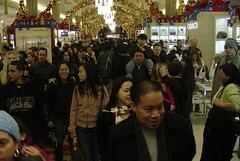 It has routinely been the busiest shopping day of the year . NYC is not America as you probably know, so I really did not shop that day during the 3 years I spent there. It is only when I was living in Atlanta and New Jersey that I saw people being crazy about Black Friday coupons and massive discounts. In the States you have identical shopping malls across all the country with stores like Macys. Bed Bath and Beyond or TjMaxx to name a few. Compared to Europe, clothes for example are half the price in regular time and when you have Sales, not only on Black Friday, you can buy a nice branded pair of jeans for $10 and a suit for less than $50. As a result I have bought many things I did not really used just because it was “cheap”. Conclusion: People get totally irrational about buying when there is massive sales and I think buy things they don’t need. Why Black Friday Is My Favorite Holiday ? This entry was posted in American Culture, culture, intercultral, United States and tagged american culture, Black Friday, black friday shopping, Thanksgiving, United States. Bookmark the permalink. 4 Responses to American Culture: What is Black Friday ? You didn’t mention where the name comes from, so I thought I’d chime in: it’s generally said that this is the first day of the year that businesses go “in the black” (as opposed to “in the red”) profit-wise. Many companies count on this day to bump up their quarterly and annual sales. Without the insanity of shopping in the middle of the night, they argue, the whole American economy would collapse. Oh, wait, that already happened this year. When I was teaching ESL in Barcelona, I had a lesson plan about American “holidays” and my students refused to accept that Black Friday was an actual thing! If you understand the concept of Balck Friday then it tells a lot about the American culture in general and its values. Personal success is definetively linked to whealth ! Today’s Black Friday in the US. If you would like to know more about this, please read Anne Egros’ article about this. Well, we’re on the same corner, in that respect… I also wrote a post about it! Thanks for initiating the discussion on Linkedin! Greetings from La Paz!